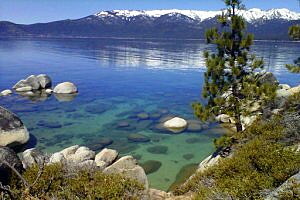 SOUTH LAKE TAHOE, Calif. (CN) – Water officials must change how they manage California’s elaborate storage and distribution system to address six years of warmer-than-average temperatures, the state climatologist said on Thursday. “Our expectations are that we will continue to see snow lines rise which will change the way water is distributed across the Sierra,” said Michael Anderson, the California state climatologist for the Department of Water Resources. Anderson spoke at the water department’s first snow survey of the year at the Phillips Station at Echo Summit just southeast of Lake Tahoe. The climatologist said the average temperature for the winter so far was 2 degrees to 4 degrees Fahrenheit warmer than average temperatures for the region. “This means we have to get used to water that appears as rain rather than snow and the way the watershed behaves,” he said. Snow is critical to the water storage and distribution system in California because a large snowpack melts incrementally throughout the spring and early summer, gradually replenishing reservoirs throughout the state. Half of the precipitation that falls in California, which enjoys a Mediterranean climate marked by wet winters and bone-dry summers, falls within a three-month period that spans December to February. The vast majority of precipitation comes in between October and May. Therefore the water content in the snowpack is the measurement most closely watched by water managers and the thousands of farmers, wildlife managers and other enterprises that rely on routed water from the Sierra during the Golden State’s dry summer months. While not necessarily encouraging, the news delivered Thursday could neither be classified as devastating. The snowpack measured in at 25.5 inches with 9 inches of water content, representing about 80 percent of its historical average. Officials acknowledged that a below-average snowpack is not ideal, but they contrasted this year’s first measurement against that of last year, when there were only a few patches of snow at the measurement station. “The season is still early and anything is possible from now until May,” said John King a water manager with the state water department. King also noted that the all important water content in the snowpack across the Sierra is 67 percent of average, meaning that much of the precipitation has fallen as rain rather than snow. Both Andersen and the director of the water department said the increase in average temperatures and the decrease in water content is directly attributable to climate change. The water department has conducted manual snow surveys at the Phillips Station since 1964. The most important survey comes in April 1, when the snowpack is widely considered to be at its peak. The water department combines the survey at Phillips Station with data collected from hundreds of snow pillows throughout the Sierra to get a snapshot of the water content throughout the state.